Contact us today to make an appointment or if you have any questions. We are a experienced electrical service & maintenance company providing a wide range of services to make your life comfortable and safe. Our highly trained experts can fix any problems small or large. Our mission is to ensure people’s comfort and safety in their home or business at all times. To provide the best and the fastest help at fair prices. We stand for quality, safety and credibility. We have been working for years to improve our skills and expand the spheres of our work and to use the latest tools, so our customers receive the best results. Our main goal is to provide our customers with the most comprehensive list of services. We aim to continually train our expert team in the latest technologies. Our team is on call 24hrs a day 7 days a week to resolve any electrical problems you may have at your home or business premises. Our qualified & experienced emergency team will respond urgently and fix the issues quickly! At REED Group Services our prices are both fair and competitive. We offer flexible payment options for all our services. All our technicians are highly qualified, experienced and trusted and all receive training in the latest technologies. 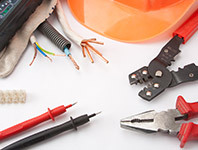 You can be rest-assured that when calling REED Group Services for your electrical needs, you are in the safest hands. We provide discounts on a regular basis to help our customers save. Be sure to subscribe to stay up-to-date with our specials. Forget about your electrical problems! Rely on our experienced team to fix them!